Financial Times on Piketty: His data is wrong. Time for some answers, Thomas. But as Matt Yglesias notes, their disagreements about some countries seem fairly minor. Here, for instance, is the data on France, with Piketty’s trend line in blue and the FT’s corrected version in red. In the end, they basically overlap. (You can find this graph, and the FT’s more detailed explanation of its conclusions, here). However, the paper does level two somewhat serious accusations. First, it says Piketty has covered up a giant gap in America’s historical records on wealth concentration. “There is simply no data between 1870 and 1960,” the newspaper states. “Yet, Prof. Piketty chooses to derive a trend.” This charge is neutered a bit by the fact that Gabriel Zucman and Emmanuel Saez recently released a detailed analysis of U.S. wealth inequality dating back to 1913 that shows an even more dramatic increase than what Piketty found. 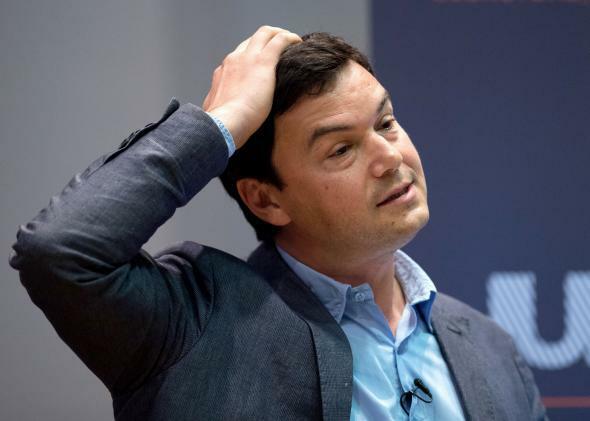 But Piketty will nonetheless need to spell out how he reached his own conclusions in a bit more detail. The much more important point of contention is Great Britain. The FT argues that Piketty’s graphs simply “do not match” his underlying data on the UK, and that official estimates show no significant increase in the country’s concentration of wealth since the 1970s. For the time being, we have to do with what we have, that is, a very diverse and heterogeneous set of data sources on wealth: historical inheritance declarations and estate tax statistics, scarce property and wealth tax data, and household surveys with self-reported data on wealth (with typically a lot of under-reporting at the top). As I make clear in the book, in the on-line appendix, and in the many technical papers I have published on this topic, one needs to make a number of adjustments to the raw data sources so as to make them more homogenous over time and across countries. I have tried in the context of this book to make the most justified choices and arbitrages about data sources and adjustments. I have no doubt that my historical data series can be improved and will be improved in the future (this is why I put everything on line). It’s a bit early to draw conclusions about the FT’s report. But the disagreement over Britain is jarring. And given that Piketty’s book is seeking to make universal claims about the nature of capitalism, he’s going to need to provide a more detailed rebuttal.